August 6, 2017 Ron Thomson 707 Views 0 Comments Adam Cruise, EVERYTHING about the Xanda hunt was absolutely legal, Mankind cannot change nature’s rules just to satisfy his own emotional whims and/or ethical needs., Shock Wildlife Truths, The way that nature operates is not always predictable. This article (click on link above) kindles the idea that the debate surrounding the death of Xanda the Lion is not over! But I welcome the opportunity to put this latest article into a TGA perspective. It was written by Adam Cruise, a notorious South African animal rightist and prolific writer of pro-animal rights articles. Like his colleagues always do, he has behaved in this instance, like a dog worrying a bone. The author draws extensively from the opinions of one of his international animal rightist gurus – The Humane Society International – whose opinions are worthless in any wildlife management debate because the HSI: rejects (without rational reason) all the principles and practices of science-based wildlife management; rejects (without rational reason) all and every argument in support of hunting – because they are dogmatically opposed to any kind of hunting; and they know absolutely nothing about the dynamics of lion ecology. Their every utterance is based on emotion – and I will bet my bottom dollar that that emotion will make a lot of money for them from their new Xanda-the- Lion propaganda. Remember: The animal rightists’ purpose in life is to ABOLISH all animal uses by man – and to persuade mankind to become entirely vegan; they make no distinction between legal and illegal hunting – or legal and illegal trade – they simply disapprove of ALL hunting and all trade (without rational reason); they disapprove of any and all kinds of sustainable-use-of-wildlife programmes for the benefit of mankind (without rational reason) and they have made it into an art to use ‘conservation’ for the purpose of raising large sums of money from the general public (with which to fill their own NGO war chests), rather than themselves raising money for the genuine needs of ‘wildlife in conservation’. In debates like their Cecil the Lion campaign (based on lies from start to finish), and now their Xanda the Lion campaign (more lies and distortions), they gnaw at every titbit of sinew they can find, looking for any excuse to support their point of view. It is good, therefore, that our readers have had another opportunity to see and to understand just how these nefarious people operate, and to measure what they say against what the TGA says on its social media platform. We (TGA) do our very best to project what responsible and honest wildlife management practitioners have to say; and what the wildlife industry believes in. EVERYTHING about the Xanda hunt was absolutely legal. The professional hunter concerned behaved impeccably. What the author has said about the lion research programme is a myth. The article was clearly designed to mislead the public. And the fact that Xanda was in the company of a female (or females) and cubs (if that is true), does not change the fact that he was (or they were) ousted from their established and demarcated territory inside Hwange National Park by a younger and stronger male. Lions do not leave their territories on a whim. If male lions do leave their territories voluntarily, they are asking for trouble – because when they return home they will find another male in occupation. Xanda, therefore, had been kicked off his range and he was seeking a new place to live outside the national park when he was shot. And however many lions there were with him at the time, they were/are all surplus to the national park’s lion population. So, one way or another, they are all destined to die. The way that nature operates is not always predictable. Nor is it necessarily “nice”. And it is often not very “humane” or “fair” either – by human standards. The way that nature works, however, is the way that nature works! 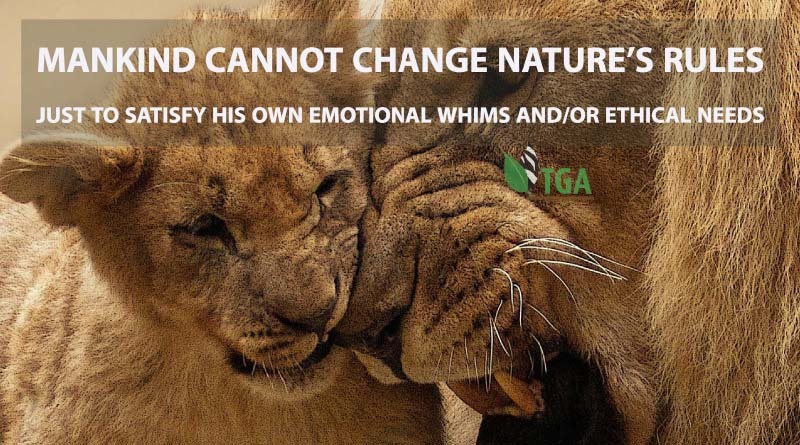 Mankind cannot change nature’s rules just to satisfy his own emotional whims and/or ethical needs. THAT is what society is going have to learn to understand, and to accept. And, on that practical and responsible note – even though the animal rightists will no doubt keep stirring the pot – I declare that the debate concerning the shooting of Xanda the Lion is now well and truly closed.